Shay Benson found a community program that offered a way out of the drugs, gangs, and poverty that had been her life. With help, she found a job as a bank teller, found a decent place to live, and began taking accounting classes. For the first time in her life, she had hope for the future. That changed when her younger brother Caden came to her for help. He needed $5,000 immediately, or he would be killed. Against her every instinct, Shay yielded to her brother’s frantic pleas and stole the money from the bank. Two months later, she is on her way to prison, having pled guilty to embezzlement charges. She had not seen her brother or the money he promised to repay within a week since she gave him the $5,000. Three years later, Shay is released from prison, bitter and hopeless. With no resources, she finds refuge in a Seattle church, thinking that she will be safe and warm there until it is late enough to find a bed for the night in a homeless shelter. Three years ago, Drew Douglas lost his wife to ovarian cancer. He has struggled since to care for his children, nine-year-old Sarah and thirteen-year-old Mark, and to fulfill his pastoral responsibilities. But his children are still hurting, his church is steadily losing members, and Drew is facing a crisis of faith. He is questioning whether he should resign his position as pastor, or even leave the ministry altogether. It is in this state of mind that he meets Shay. She has taken a seat in the church sanctuary as Drew prayed at the altar. She clearly needs help, but Drew is tempted to ignore the need and send her on her way with a promise to pray for her. Instead he finds himself extending a helping hand that includes a meal and, more importantly, a recommendation that she be admitted to Hope Center, a year-long life skills program operated by a local gospel agency. Shay is admitted to the program. Gradually, she and Drew become friends, and friendship turns into romance. Shay also develops a close connection to Drew’s children. But not everyone in Drew’s church is pleased to see the growing tie between their pastor and a convicted felon. Complications ensue when Caden and Shay’s former, drug-dealing boyfriend reappear in her life, threatening her new life. Just when the problems they bring seem to be resolved, a theft and a promise further jeopardize Shay’s life. Will Drew’s love and the life he and Shay hoped to create together survive this latest threat? 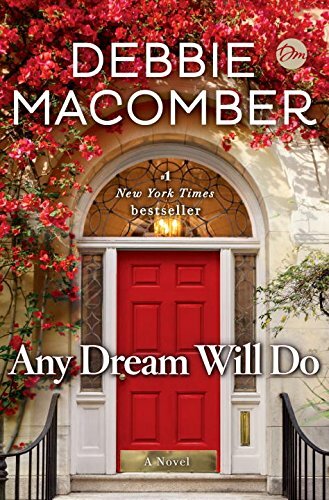 Debbie Macomber is the queen of the sweet, heartwarming, inspiring romance, and this novel with its theme of redemption and the opportunity for a new life is very much in the Macomber tradition. Macomber’s readers expect that her books will give them relatable characters dealing with real-life problems and will offer an emotional pay-off in line with their values. Any Dream Will Do has all the right ingredients, but I failed to connect with these characters. I am a long-time Macomber reader, and her Blossom Street, Cedar Cove, and Rose Harbor characters all seem as substantial and familiar as my neighbors. Even her angelic characters such as Shirley, Goodness, and Mercy and Mrs. Miracle leave me eager for a return visit with them. But this time I felt as if I should be engaged with Shay and Drew to that degree, but I wasn’t. Devoted Macomber readers will likely be pleased with this story, but readers new to Macomber will do better to look elsewhere for books that more skillfully demonstrate that Macomber magic. I read this one too and didn't think it was as good as her other books. Glad I wasn't the only one. Hope she goes back to her blossom series. I love the Blossom Street books too. I'm sure you are not alone in that response Pat. I just read her Christmas ARC. I enjoyed it. I liked Merry and Bright too, Denise. I will be reviewing that one closer to its pub date.